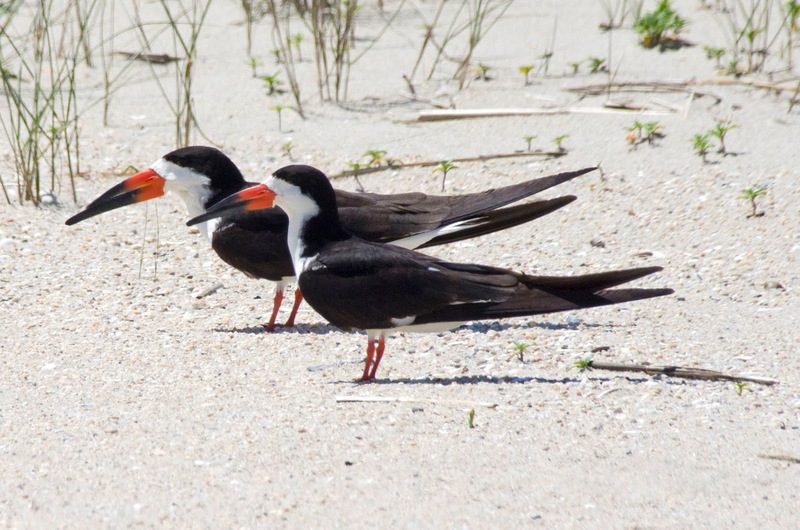 Black skimmer couples, Rynchops niger, are nesting now on New Jersey beaches. Sandy beaches with light vegetation like the one pictured are among their favorite places to nest. The nest is just a scrape in the sand. Humans also like beaches like this and human disturbance combined with natural predation, habitat degradation, and flooding has led to these unique birds being endangered in New Jersey. I took the picture from farther away than it looks with a telephoto lens and tried not to seem aggressive. They ignored me so I think I was successful. Click to enlarge. Adult black skimmers have a wingspan up to about 50 inches. The huge sleek bird feeds by flying low over water with its beak open, the lower mandible cutting through the surface of the water and closing when it encounters a fish. (Click here to see it on YouTube.) But the thing I like most about them is the way they rest on the beach. Click on the photo above to enlarge; the four birds in the center are lying prone on the sand like a row of downed bowling pins. 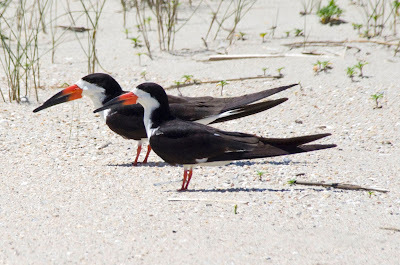 There is nothing average about a black skimmer.